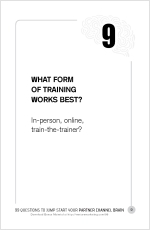 Home → Uncategorized → What form of training works best for your Channel Partners? File this under: It’s not the mode of training, it’s your boring approach. Here’s an example of what one of my startup clients did a number of years ago…to great success. We’re hip. We’re fun…and smart! Synergetic Micro Systems knew that in order to get an unfair share of their distributor’s time and attention, training had to be fun and to some degree, entertaining. “I walked into Hannover Fair in 1998 in Germany and heard this awesome American blues at the HMS booth. Turns out it was Pia and the JMB—a darn good party band! I’ve got a Fieldbus Man for my I/O. 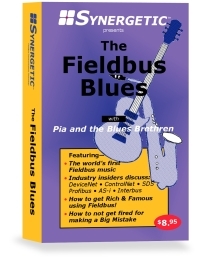 You can’t do better than a fieldbus man. Pia wrote the music with guitarist John Marshall and recorded it in Germany. We added interviews with the directors of the major trade organizations and made it an educational tape. Did you catch the highlight text: a lot of sales guys who spend time in their cars? Not only did this catchy tune get people in the industry talking, it was perfectly suited for the people he wanted to educate. As sales reps listened to the song, they were subconsciously picking up key industry jargon. So, yes, Synergetic came across as hip and fun. But more importantly, the song (and the other educational resources conveniently included on the cassette tape) positioned them as experts. What’s the right mode for you? Recording a blues song worked for Perry. It probably won’t work for you. You’ve got to figure that out. The “figuring out” part is usually where it’s common—and often necessary—to bring in clear thinkers and idea people, like us (pardon the commercial interruption, but this is what we do a lot of). Don’t overcomplicate things when a simple approach will do. If all your competitors are doing training one way, do something unexpected. For goodness sake, don’t copy what your competitors are already doing! Instead, be original. Like Perry, consider age, demographics, and where they spend their time. If you provide podcasts, for instance, don’t dismiss hiring solid voice talent. Staffan, great to hear from you! It’s amazing what a little creativity can do — especially when you have no budget.